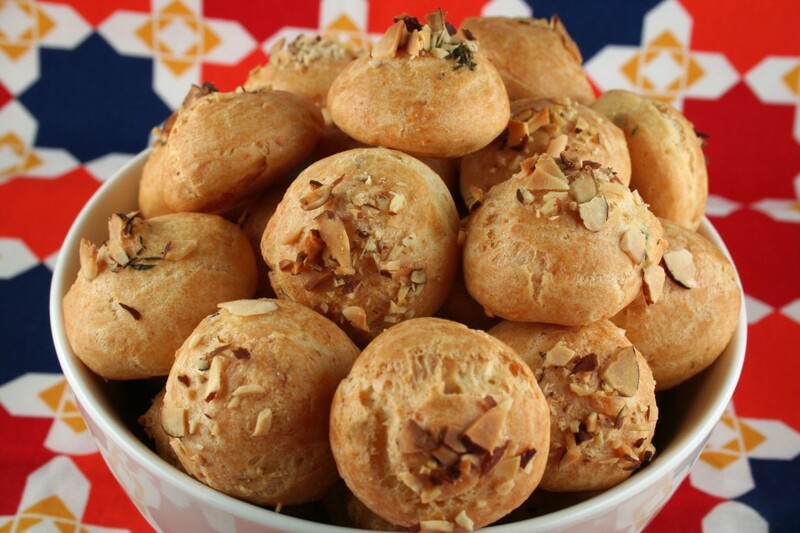 Classic cheese puffs or French gougeres are always a delicious addition to any meal. Unfortunately, like cream puffs (same pate a choux batter base), these are scrumptious shortly after coming out of the oven but barely edible the next day. 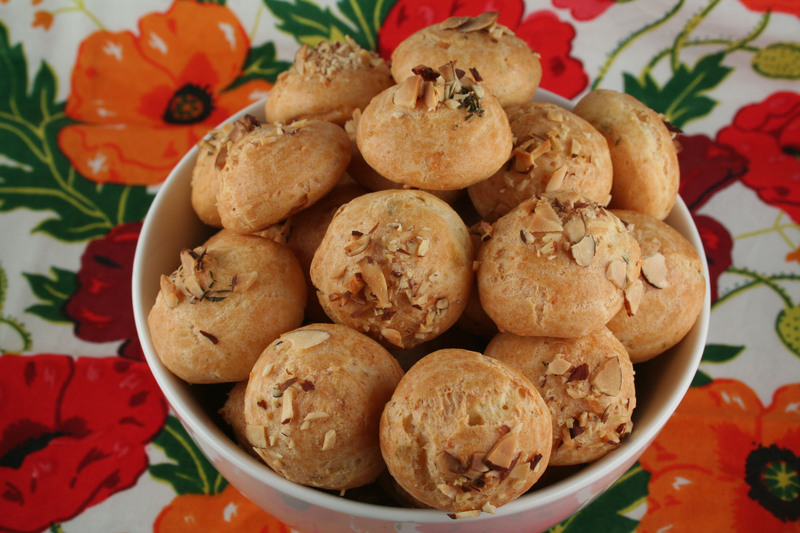 The recipe as written in The Art of Fine Baking lacked the strong cheese flavor I craved from these light puffed morsels. I ended up using an incredible amount of cheese, double the amount in the original recipe. Plus I added Parmesan for an additional punch and a pinch of cayenne and paprika for a little zip. Of course, I then had to take it one step further and add a fresh herb. A sad bunch of thyme happened to be sitting in my fridge, waiting to be used, so I added it to the almond Parmesan sprinkle before baking. The rich smell that wafts through your kitchen while these sharp cheesy nutty bites bake, is almost worth it in itself. A note about the baking time for this recipe: unlike cream puffs, you do not want to bake these until they dry out in the center. These should be removed from the oven within 5 minutes of barely turning a light golden brown. Combine butter and water in saucepan. Cook over medium heat until butter is melted and mixture is boiling. Turn heat to very low. Add flour mixed with salt all at once. Stir vigorously until a ball forms and does not stick to the pan. Stir over heat another minute or two to slightly dry out. Remove from heat and transfer to a clean bowl. Allow to cool 1 minute. Add eggs, one at a time, beating hard after each addition. The final egg should beaten with a fork and added gradually to ensure the right consistency. Batter should be just stiff enough to stand at a peak when a spoon is withdrawn or if a finger is run through it, the channel fills in slowly. Sometimes it’s necessary to add slightly less or even one more egg depending on the dryness of the flour and the temperature of the room. Beat all but a 1/4 cup of cheese into pate a choux batter. Combine nuts, thyme, and remaining cheese in a small bowl. With a pastry bag or spoon, form small high mounds on parchment paper lined baking sheet. Sprinkle nut cheese mixture on top. Bake about 35 minutes or until puffs are lightly golden brown and there are no beads of moisture showing. Serve warm.